Lingual braces are just like other fixed braces but they are placed on the inside of your teeth. 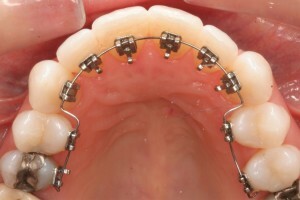 This means that the brace controls the tooth movement precisely but that it can’t be seen from the front of the mouth. One of the reasons many people request invisible braces is that they do not want the braces to be visible. However, clear aligners are limited in the ways they can move teeth and can’t deal with all orthodontic problems. Lingual braces can deal with almost all problems, creating ideal types of tooth movement, without being visible. These types of braces do not have to be attached to every tooth in simple cases, which often means that there can be a significant cost saving over other types of brace treatment.